The Wildlife Trusts' Nature Challenge: A Mini-Wildness. On seeking a mini wildness for today's nature challenge for the 30 Days Wild activities and blog updates, a broken branch was discovered on an apple tree; it was riddled with holes from beetles that had bored into the soft wood and made it their home. Across many of the holes were spider silks and in its cracks and crevices were small fragments of beetle shells and evidence of other mini-beasts. 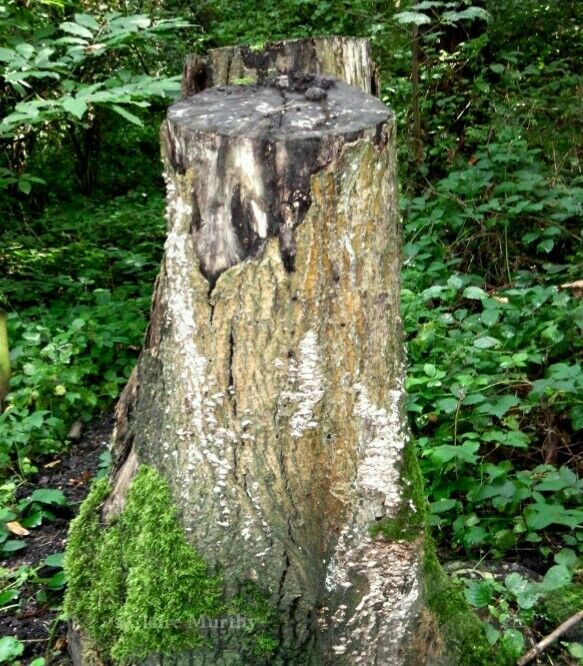 This is a most fascinating tree stump. Though it has no particular story, it has many secrets. Amongst such seasonal and landscape changes in this small woodland, such a stump may go unnoticed to the passer-by. Yet there are many holes and markings in it that reveal more. It has history; it's of the past and in the process of becoming the past - inside and out - there are insect eggs, old scars from beetles and holes that could provide storage for squirrels. Native Tree Wildlife Home : decomposing wood, moss and lichen. In the garden is a fairy ring of tree logs that are now crumbling, soft-looking logs that have been worn with age... They have been a good home to an untold number of insects and have provided joy and interest to many children and adults who have spent a few minutes of time inspecting other worlds of fascinating creatures in the wilder patches down at the end of the garden. For the #30dayswild post in 2016, Nature Challenge : Search for Mini-Wildness, click here.